There is nothing better than the return of Fall and all things pumpkin! 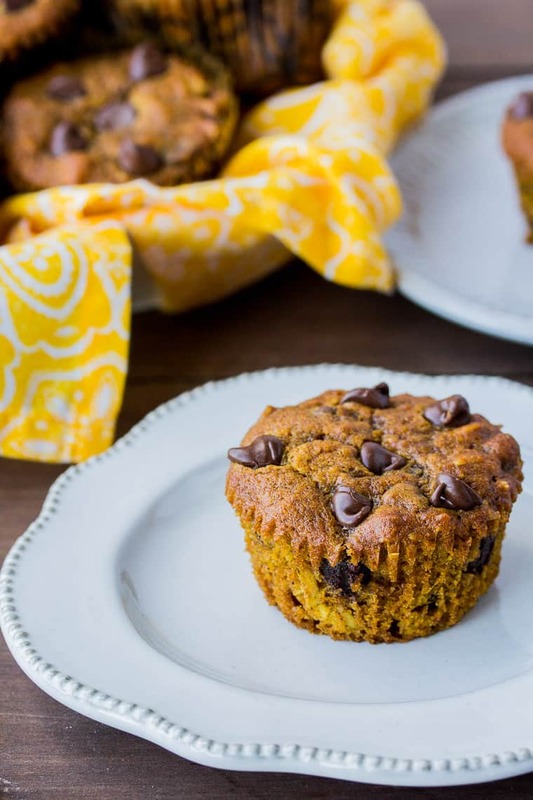 Get your fix with these moist, delicious Pumpkin Chocolate Chip Muffins! Each Fall, I over-indulge in all things pumpkin. Come December, I really believe that I’m never going to eat anything pumpkin ever again. But, after a long, cold winter and all of the light, fresh foods of Spring and Summer, I find myself 100% back in comfort food mode just in time for the season. Seriously, give me all of the Pumpkin Spice Lattes and sweet pumpkin-y treats. All of them. I’ve mentioned before that I was really late to the game when it came to pumpkin desserts. For whatever crazy reason, I really didn’t think I’d like pumpkin and so I was reluctant to try it until a couple of years ago. It was love at first bite, and bittersweet, as I realized exactly what I had been missing all those years! On the bright side, this left a lot of opportunity to create and share new pumpkin recipes! I absolutely love Pumpkin Chocolate Chip Cookies, as these were my first tango with that delicious gourd! This year, I decided to take everything I love about those cookies (the pumpkin, chocolate, and moistness!) 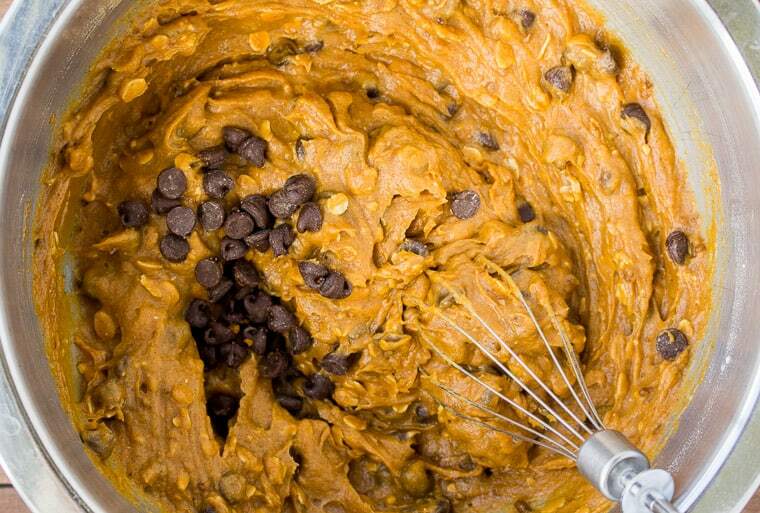 and create an equally delicious pumpkin spice muffin with loads of chocolate chips! I also threw some oats into the mix for added texture and heartiness. 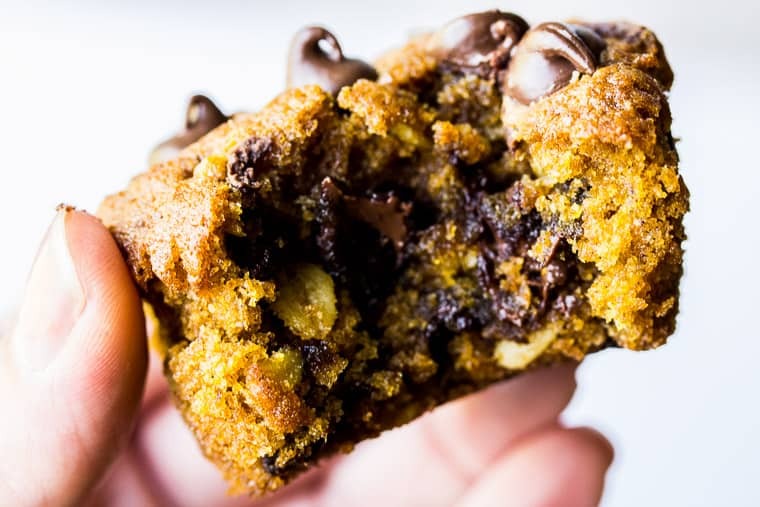 I am happy to report that every single bite of these Pumpkin Chocolate Chip Muffins is bursting with an amazing combination of pumpkin spice and sweet chocolate in a moist, fluffy muffin! These muffins are easy to make and freeze well too! They are the perfect Fall treat, but also great as a quick breakfast or snack while on-the-go! Grease a standard muffin pan or line with paper liners. 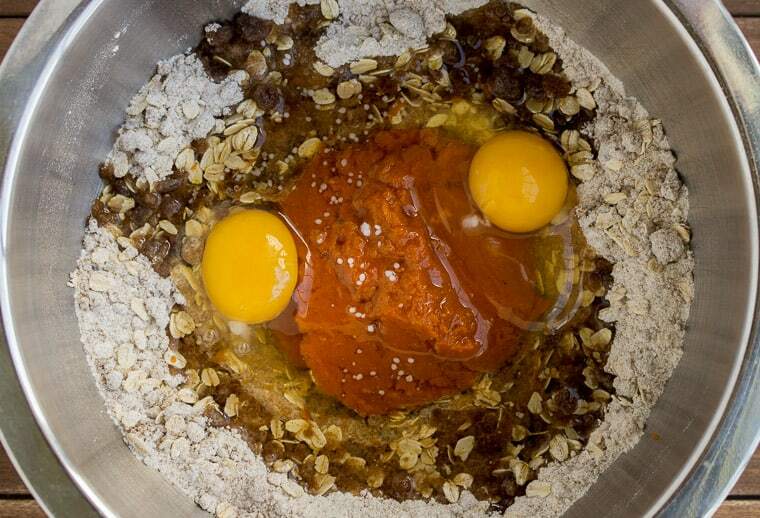 Combine the all purpose flour, rolled oats, baking soda, baking powder, salt, pumpkin pie spice, sugar, and brown sugar. Mix until well blended. Make a well in the center. 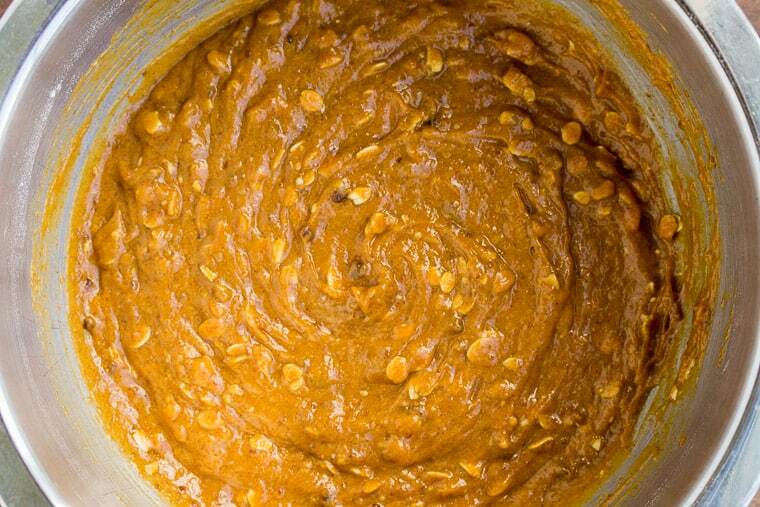 Add the eggs, coconut oil, and pumpkin puree to the well. Whisk together and then combine with the dry ingredients until everything is moist. Fill each muffin well 3/4ths of the way full. Add extra chocolate chips to the tops, if desired. Bake 28-32 minutes, or until a toothpick inserted into the center comes out clean. For muffins, I like to line a basket or dish with a pretty napkin or towel and pile the muffins up high! To freeze muffins, allow them to fully cool. Then wrap them individually in plastic wrap. Alternatively, you can add them all to a plastic freezer bag. Allow to defrost at room temperature or place an unwrapped muffin on a napkin and microwave for approximately 30 seconds. 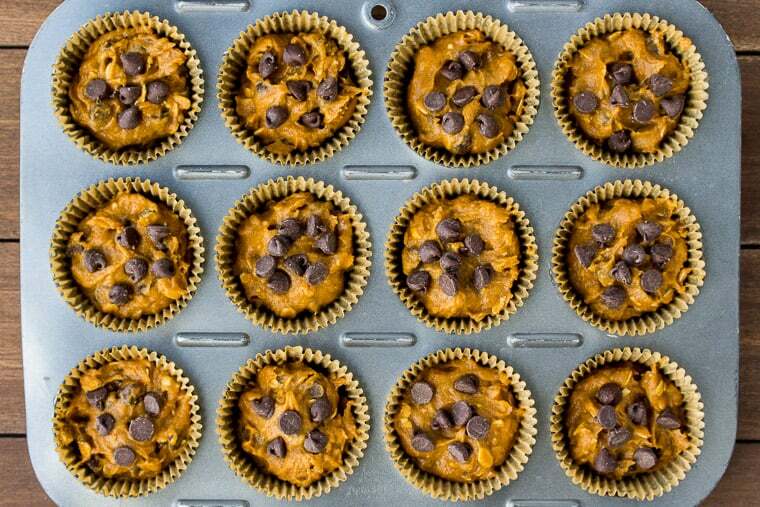 Love this Pumpkin Spice Chocolate Chip Muffins recipe? Follow us on Pinterest, Instagram, and Facebook for more! 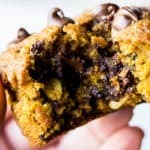 Every bite of these Pumpkin Chocolate Chip Muffins is bursting with an amazing combination of pumpkin spice and sweet chocolate in a moist, fluffy muffin! Grease a standard muffin tin or use paper liners. 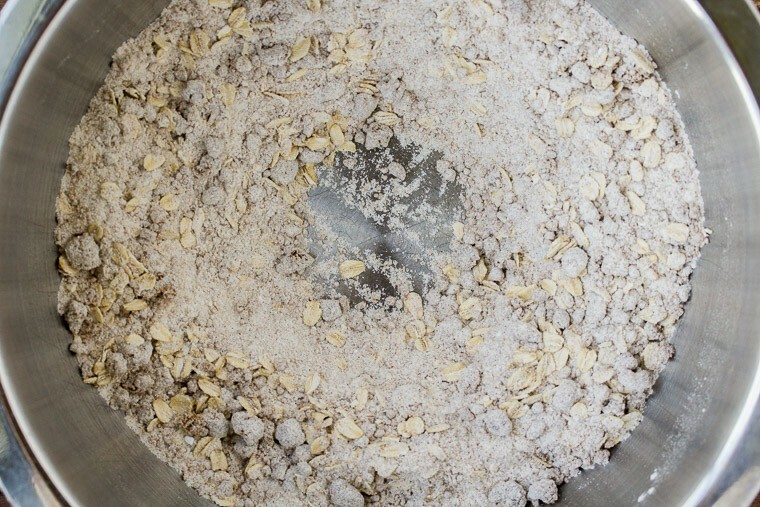 Combine the flour, oats, baking soda, baking powder, salt, pumpkin pie spice, and both sugars in a medium bowl and mix well. Make well in the center of the dry ingredients and add the eggs, coconut oil, and pumpkin puree. Whisk the wet ingredients together first, then into the dry ingredients. Fill the muffin pan wells 3/4ths of the way full. Top with additional chocolate chips, if desired. Bake for 28-32 minutes, or until a toothpick inserted into the center comes out clean. Hi Lauren, These muffins looks so good and can’t wait to try them. I do have a question, Is there anything I can use instead of the coconut oil? Thanks for any help you can give me. 🙂 Have a wonderful day. P.S. I rated these a 4 just because I have not made or tasted them yet. I hear you! I love all things pumpkin and the combo of oatmeal, pumpkin and chocolate is my favorite. You have an amazing amount of chips in there. I approve! My motto is never skimp on chips. This is perfect for the “how is it almost here already” holiday. Adding to the list! 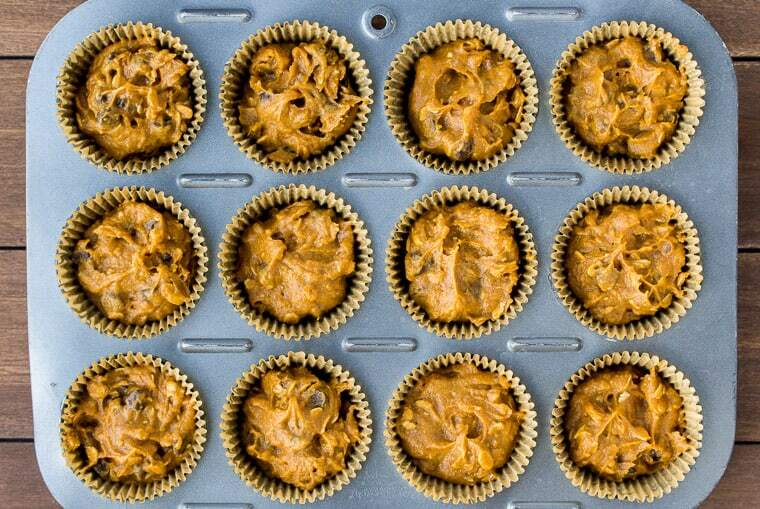 Pumpkin season is coming soon, and I can’t wait to try these muffins. They look so tempting. 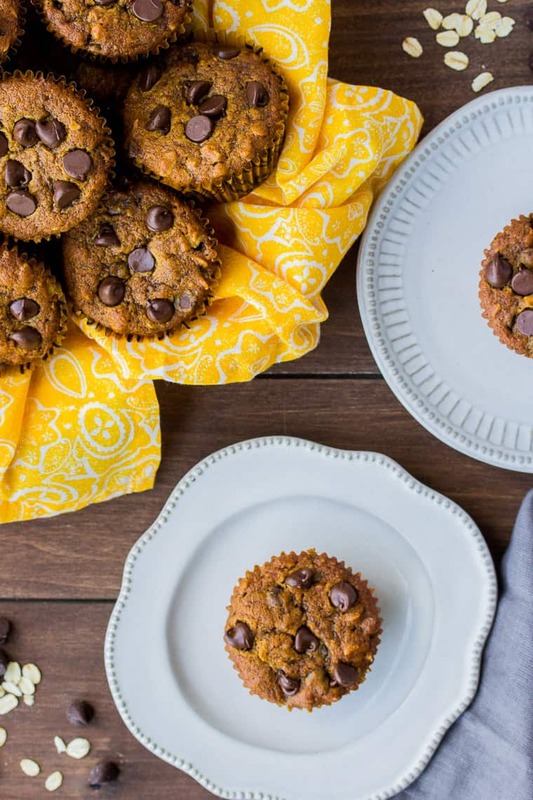 These muffins are such a great way to start a fall morning! I am so excited for all the pumpkin recipes to start coming out. 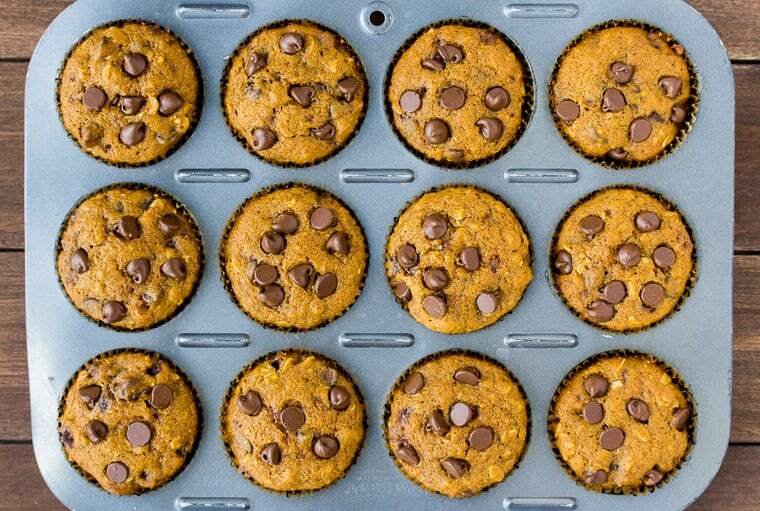 Pumpkin and chocolate in a muffin sounds amazing. This recipe is making me excited for the fall season! I can’t wait to try them!